The weekend is just around the corner which means it’s almost “date night”. Like many couples, we have found that we are doing a lot of the same things over and over. Dinner and A movie with a friend. Dinner and a movie with two friends. Time to get out of that rut! It doesn’t matter what the activity is I just want to have fun with my spouse! Date nights don’t have to be expensive or fancy.. sometimes a little imagination goes a long way and it’s fun to change things up every now and again. Heck, you can even make a trip to home depo for a sump pump a “date” if you try hard enough. Ok, that might be stretching it a little bit. Date night is one of those things that we’re fortunate enough to take advantage of on a semi-regular occasion. We’ve got grandparents that are willing to babysit or take the kids for the night on a regular basis – making it that much easier to get and experience everything that out great city has to offer, but we haven’t tried anything new. We have a case of the ” I don’t know, what do you want to do?” Well, now I do. 1. Glow in the dark mini- Golf. A glow-in-the-dark course, blow-up dolls, creepy clowns, and moving pieces added in for good measure—what’s not to like? If you like getting spooked and appreciate the occasional fright, this is the place for you! 3. Take part in a drop-in climbing adventure at one of the local rock climbing facilities. 4. Visit the gun range. I have never shot an assault rifle or a handgun, but I want too! There are a couple of places here in the city that are perfect for a newbie like me. 5. Break out your inner Picasso! Arrange to attend a Paint nite experience where their artists guide you, step by step, on transforming your blank canvas into a mosaical masterpiece! Ok, maybe not a masterpiece but a darn good painting that you’ll be proud to hang above your mantlepiece! These events are typically two hours long and involve lots of drinking, painting, laughter, and a jolly good time! 6. “9 and dine” Most local golf courses offer 9 holes of golf, practice at the driving range, use of a power cart, and coupon for dinner for 1/2 the price of a regular round of golf. FOUR!! 7. Stargazing is hands down the cheapest, easiest way to spend the evening. Visit amazing space to find out what to look for any night the week Or print off a free star map. Don’t forget a blanket, snacks, and some binoculars if you have them. 8. Grab a cup of your favorite coffee to go and explore the river valley. 9. Try something new together… earlier today I was looking up a beginner paddle board course perfect to get your feet “wet”. 10. Re-create your “first date”. 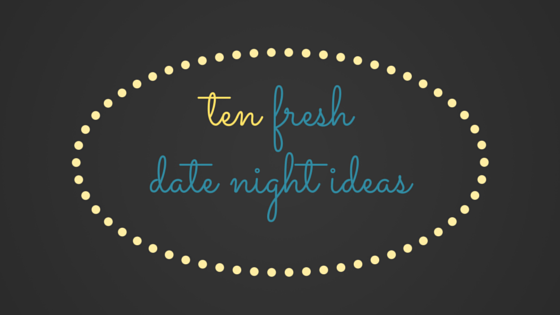 What is your favourite date night idea? I would love to hear about what you and your special someone do on Date night in the comments below! Great list. Hubby and I still go on dates now and then. I love the idea of recreating your first date. The hubs and i are lucky to have a date night once a week. It would be fun to go back to the place where we had our first date. I always think those paint nights look and sound so cool. I’d love to try something like that myself. They are so much fun!! I went with a girlfriend of mine for the first time and even thoug hthe only thing I have ever painted before was a wall my painting looks awesome! We have never tried gambling before on a date… did you go to a casino and play the machines or are you a texas hold em kinda couple? You know, it would be fun to try golf for the first time in years. 9 holes at a golf course could be good one for us. I love the “9 and dine” option. Especially if you don’t have the entire day available to spend at the golf course. We are hoping to get out this weekend actually if we can arrange child care. I love just having a quiet dinner with my hubby and watching a movie for date night. All at home and just hanging out! Glow in the dark putt-putt sounds like a BLAST!! One of my favorite things to do is have an at-home date night. We order dinner, rent a movie and hang out in our jammies. We can have actual conversations, pause the movie when we want, etc. Love your ideas! Hubby and I don’t go out on dates often, we need to do it! These are wonderful ideas. I so could use a date night with hubby, we have not had one in over 10 years! You my friend, are LONG overdue for a night out! Have you tried putting the kids to bed early and having a nice dinner at home just the two of you? I love dinner and a movie dates. Perfect balance of entertainment and conversation. We like going to the VIP at the movie theater. Dinner and a movie all in one place! I also love having a beer while we watch a movie. These are all great ideas! My husband and I try to do a date night a few times a month. It’s so important. I totally agree! We would love to have one weekly but, sometimes it just doesn’t pan out so we cherish the time we do get to spend together. Such great ideas! My husband and I are doing a glow in the dark 5k run this weekend to get out of our date night rut! That sounds like fun! We just started running… 2k is about all we can muster at the moment. LOL! My husband and I try to do a date night every week. Even if we just go for a walk together, it’s nice to be alone with him. Even after 14 years of marriage we still hold hands while we walk. Take a cooking class together. -OR- Do something “tourist-y” in your own city. There are probably places you haven’t been to. That would be so much fun… we have been here for almost 9 years and there are so many things we haven’t experienced yet!